Part of the fun of watching a new series is seeing how the writers and performers navigate different comedic and dramatic rhythms. For most new shows, not everything works right away, and there’s a built-in grace period where the talent figures out their strengths and weaknesses. Arguably the best thing about Baskets is that it knows exactly what kind of show it wants to be from the first few minutes of the pilot. It can deftly move between broad slapstick and nuanced character drama, and most importantly, mine comedy from its characters’ behavior while also still sympathizing with their general plight. Both the humor and pathos mainly derive from Chip’s delusional dream, which can only happen if it’s taken at face value. For a while, this storyline works pretty well, especially as an exploration into Chip’s psyche. It also produces far and away the most moving moment in the episode: After Chip moves back in with his mother when he fails to pay rent, he find a box of his old clown material (false teeth, red nose, etc. ), which he stares at longingly. 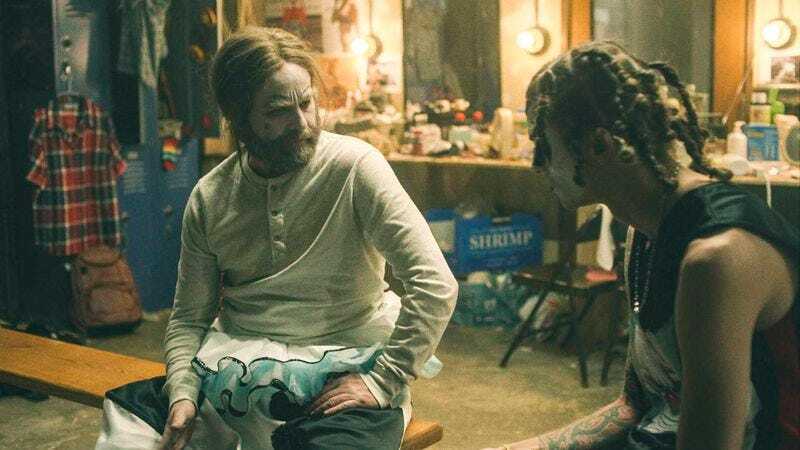 It’s a really stellar scene sold beautifully by Galifianakis that says more with silence than it ever could with words, and it captures the tragicomic mood that Baskets wants to maintain wonderfully. But despite its solid foundation, it doesn’t have nearly as much as impact because of its predictability. Midway through the episode, the Juggalo asks Chip how he’s going to make money, to which Chip replies that at the rodeo he’s an artist and that if he wants to make money, he “might as well work at Arby’s.” Naturally by the end of the episode, the Juggalo has shed his clown makeup and is cheerfully working the cash register at Arby’s, as Chip looks on from the outside, set to give him the box from his childhood, seething with anger. Unaware that he’s disappointed Chip, the Juggalo tells a customer that Chip is a great man who “taught him everything he knows” and “changes lives,” just as Chip rollerblades into a car door spilling everything in his box. It’s a despairingly poignant moment that I love in theory, especially how the “rollerblading into a door” bit is foregrounded early in the episode, but that nevertheless doesn’t quite work in execution simply because the end game was so apparent. “Trainee” is still a second episode, which means it naturally has to reiterate the series’ characters and premise: Chip still fails to make any money, the omnipresent specter of Chip’s brother Dale hangs over all of Bakersfield, and Martha is still the kindest doormat in the world, meekly moving through life trying to appease everyone even when they treat her terribly. In the episode, Martha has to sell a Costco membership or else her manager, who’s in the process of obtaining a management degree from Baskets Career College, will have to fire her. Though she timidly tries to sell one to an orange salesman on the side of the road, she fails in her task, only for Mama Baskets and Chip to take pity on her and buy one so she can keep her job. It produces a couple funny moments, especially Martha’s interactions with the manager, and Chip’s brief moment of good will works quite well, but it’s a little too lightweight for it to make any strong impression. Hopefully, Martha will be better integrated into the ensemble in the coming weeks. Overall, “Trainee” is a good example of what could reasonably be described as a “standard” Baskets episode, one that’s a little thin, but still funny enough to be compelling. 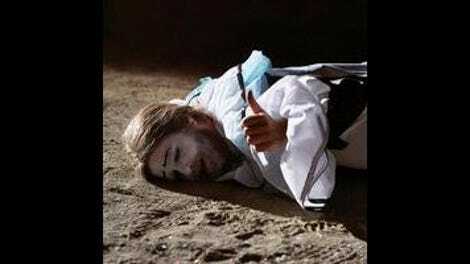 However, Baskets’ compelling premise and off-kilter rhythms, e.g. the lead-up to when Christine breaks down the bathroom door because Martha was talking to herself, are still the main draw. The series has such an elastic world that it seemingly can twist and turn at will, using its exploration of creative failure to go anywhere. That’s an important, treasured quality for a show this early in its run. These observations could just be a list of Mama Baskets moments as pretty much every scene with her is a knock out. My two favorites: 1. Her wondering aloud if Chip and Martha should start a greeting card company, and 2. Her freaking out seeing Chip right outside the bathroom. I really liked the POV shot of the bull goring Chip that opened the episode. Nice touch. Some of Mama Baskets’ cat names: Ronald Reagan, Angora, Tip O’Neill, Will Ferrel (it’s a feral cat).